Liverpool's Salah the top-priced FPL player for 2018/19 - but how much will Brighton's stars cost? Fantasy Football managers can begin to prepare their team for the upcoming season after Fantasy Premier League (FPL) released player prices for the 2018/19 campaign. Liverpool's Mo Salah, classed as a midfielder, is the top-priced player at £13m after scoring 303 points last season, while England captain and Tottenham striker Harry Kane is valued at £12.5m. The top-priced goalkeeper is Manchester United's David Gea at £6m, while five defenders will all cost £6.5m - Cesar Azpilicueta and Marcos Alonso (both Chelsea), Nicolas Otamendi and Kyle Walker (both Manchester City) and Antonio Valencia (Manchester United). The top-priced Albion player for next season is midfielder Pascal Gross, at £7m. He scored seven goals and provided eight assists last season on his way to 164 points. Goalkeeper Mathew Ryan got 146 points last season and costs £4.5m this year, while in defence Lewis Dunk, Shane Duffy, Bruno, Leon Balogun and Gaetan Bong will all cost £4.5m. Colombian winger Jose Izquierdo is valued at £6m, while Glenn Murray is the Seagulls' top-priced striker at £6.5m. 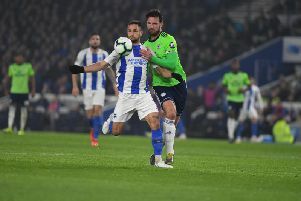 Other Albion player prices - Markus Suttner £4m; Ezequiel Schelotto £4m; Anthony Knockaert £5.5m; Solly March £5m; Davy Propper £5m; Dale Stephens £4.5m; Beram Kayal £4.5m; Jurgen Locadia £5.5m; Tomer Hemed £5m; Florin Andone £5m; Sam Baldock £4.5m. Looking at potential bargains for next season, Arsenal midfielder Aaron Ramsey is valued at £7.5m, Chelsea's Ruben Loftus-Cheek is £5.5m, Fulham midfielder Tom Cairney costs £5m, Manchester United forward Jesse Lingard is £7m, West Ham striker Marko Arnautovic is £7.5m and Albion summer signing Andone is just £5m. Click here for a list of all player values for the 2018/19 season.